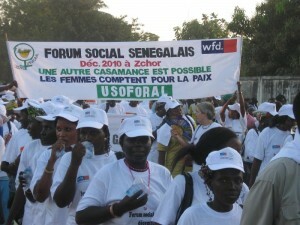 Seynabou Male Cissé, leader of AJWS grantee Comité Régional de Solidarité des Femmes pour la Paix en Casamance*/USOFORAL in Senegal, recently won the Women’s World Summit Foundation (WWSF) Prize for Women’s Creativity in Rural Life. The annual prize celebrates the International Day of Rural Women on October 15. Every year, WWSF awards 10 notable women with this prize, honoring female leaders for their courageous and creative work in the rural women’s movement. Seynabou has launched critical peace efforts in Casamance. Because Senegal has a long record of political stability, many people do not realize that the country is also home to one of Africa’s longest-running wars. The southern region of Casamance is isolated from the rest of Senegal by the Republic of the Gambia. Sparked by a separatist rebel movement seeking independence for Casamance, the conflict began in 1980 when the Senegalese government failed to deliver on a promise for the region’s independence. Protesters took to the streets, and civilians were caught in the resulting crossfire between the government and rebel forces. Although both sides signed a peace agreement in 2004, negotiations have since suspended and fighting has continued. Thirty years of armed conflict left many women in Casamance feeling powerless: unable to stop the deadly bursts of guerilla violence, unable to feed and educate their children in the midst of the resulting chaos. But Seynabou saw strength in the women of her community—strength that could be used to help solve her country’s problems. 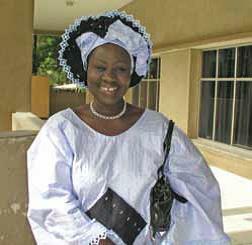 In 1999, she founded USOFORAL, which means “Let’s join hands” in the local Diola language. She worked with rural women to start a peace movement in Casamance. USOFORAL is a grassroots organization that builds on Senegalese women’s traditional role as mediators and as givers and protectors of life. The women who have joined USOFORAL work together to advocate for lasting peace in Casamance, and they have organized peace committees to mediate local conflicts and to direct reconciliation and negotiation activities. In recent years, USOFORAL has also supported local women with machinery to help them harvest crops and a revolving fund to provide them with periodic loans. By increasing the women’s ability to support themselves and their families, USOFORAL gave these rural women the time and opportunities needed to participate in politics and the peace-building movement. Seynabou has inspired so many women in Casamance to speak up for their rights. In 2011, she partnered with several women-led organizations to hold a peace vigil, bringing together about 5,000 women from all faiths to call public attention to the women who died during a particularly brutal clash between rebel and government soldiers. Seynabou also led a delegation of women at the World Social Forum in Dakar in 2011, where they spoke with national and international media to stress the need for women’s voices to be heard during peace negotiations. The work of Seynabou and the women she has inspired is creating hope for thousands of rural women and their communities in Casamance. AJWS has proudly provided financial support to USOFORAL for the last four years, and we continue to be inspired by the work they do. For more information on Seynabou and USOFORAL, please see usoforal.org and Seynabou’s award profile. 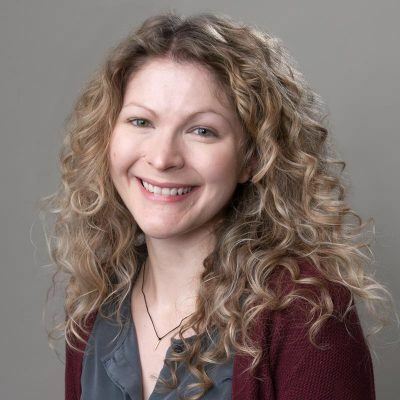 Amy Bisno is an Africa program associate for AJWS.